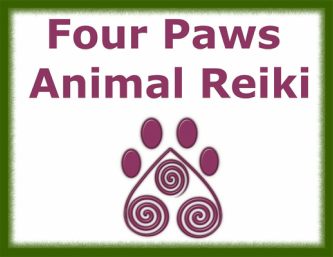 Thank you for your interest in Four Paws Animal Reiki. My mission with animal Reiki is to reciprocate the love, support and healing that animals give to us everyday. I strive to enhance the quality of life and maximize the health of ALL animals. All Reiki sessions are completed in alignment with what serves the eternal living organic highest good of the animal. Remote sessions can be sent anywhere in the world and to any animal. In person sessions are provided in the greater Albany NY area. Our animals teach us to love unconditionally, live in the moment and find the joy in everything we do. They also enjoy the simple things in life, let go of expectations, take time to relax, and to treat each other equally. Animals are great listeners, best friends, playmates, nature lovers and our companions when we are lonely. Wouldn't it be great to be able to thank them and help them live the best life possible? Schedule an animal Reiki session today. It is a safe, complimentary and alternative supplement to general veterinary care. Reiki is an energy healing modality which helps them achieve and/or maintain their greatest level of health and wellness and to facilitate their own healing when necessary.